É claro que um dia iam descobrir o verdadeiro valor de Beagá. O NY Times fez recentemente uma matéria excelente sobre Belo Horizonte. O texto é tão bom, se fosse em português eu o utilizaria para apresentar a cidade para todos que não a conhecem. Bar do Caixote one of Belo Horizonte’s plentiful informal botecos. BELO HORIZONTE, in the Brazilian state of Minas Gerais, has managed to become the country’s third-largest city while remaining almost completely unknown to the outside world. If tourists — more drawn to the sybaritic pleasures of Rio de Janeiro or the urban clamor of São Paulo — know it at all, it is because they may pass through it on their way to Ouro Preto and Diamantina, treating it as a little more than a refueling stop as they head toward those picturesque colonial-era mining towns. Its international anonymity was born of no coastline and thus no beaches, no famous Carnival and thus no February madness, and no big attractions save a few buildings designed by Oscar Niemeyer that pale next to his famous works in Brasília. And though tourist guidebooks barely make mention of them, they make for a great way for travelers to dive into the social life of a city whose metropolitan area has exploded in recent decades to over five million inhabitants. The best time to come is for the eighth annual Comida di Buteco competition in April, when some 40 of the top bars square off in categories like hygiene, beer frigidity, service and most importantly, best tira-gosto — or appetizer. Winners are decided not just by judges but by public ballot, giving Belo-Horizontinos a flimsy excuse to go out every night for a month. If you miss it, don’t worry. Every night of the year seems to have something of a party feel in this off-the-radar screen hot spot. Get your feet wet at Mercearia Lili (Rua São João Evangelista, 696, Santo Antônio, 55-31-3296-1951), a regular participant in Comida di Buteco. It is one bar of many in Santo Antônio, an upscale neighborhood of steep hills that require superhuman parallel parking skills or, preferably, use of the city’s metered taxis. The bar is typical in many ways, not least of which is the furniture: yellow plastic tables and chairs, with the maroon Skol beer logo, spilling out onto the sidewalk (600-milliliter bottles of the Pilsener Skol, to be shared in small glasses, are the citywide order of choice). The buzz of conversation and the clink of bottles — not a D.J. — provide the soundtrack; grey hair and what in the United States would be underage youth share the tables. If there were a Comida di Buteco award for “Hardest to Get To,” the Freud Bar (no address, Nova Lima, 55-31-8833-9098, freudbar.com for map) would win every year. The place is plunked down in the middle of some woods outside the city, down a winding unpaved road. The bar is built into a hill, warmed by a bonfire, and has a few tables actually in the surrounding trees. It has live music (blues and rock), and serves a limited but creative menu, like mulled wine, or a cup of squash, mozzarella and chicken soup (3.50 reais), a nice break from the bean and pork rind soup that is available at just about every boteco. Botecos are not just nighttime affairs, as you’ll find if you head to the city’s Central Market on a weekend afternoon. Sure, there are stands selling fruit, meat, the state’s famous cheese, live dogs and birds (as pets), and live hens (as dinner). But the market is also full of uproarious, packed bars like Lumapa, where authorities must chain off a chokingly slender pedestrian walkway so the non-beer-drinking shoppers can get by. A calmer choice is Casa Cheia (Central Market, store 167, Centro, 55-31-3274-9585) a sit-down place serving all its past Comida di Buteco creations, like the Mexidoido chapado, a mishmash of rice, vegetables, four kinds of meat, and quail eggs. It is also worth heading to the more far-flung neighborhoods to see some of the quirkier takes on the bar theme. (With 11,999 competitors, you do what you can to stand out.) 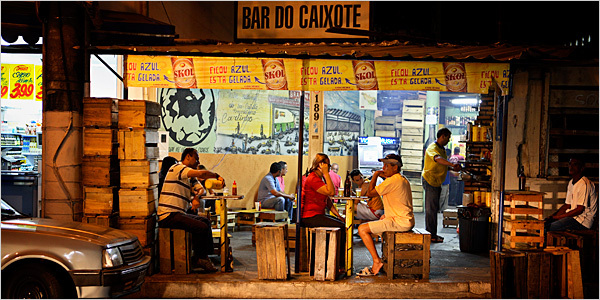 The ultra-informal Bar do Caixote (Rua Nogueira da Gama, 189, João Pinheiro, 55-31-3376-3010) literally means “Bar of the Crate,” and sure enough, the tables and chairs are wooden crates. The overall winner of the 2007 Comida de Buteco, Bar do Véio, or “Bar of the Old Guy” (Rua Itaguaí, 406, Caiçara, 55-31-3415-8455) is in an outer neighborhood and your cab driver may have trouble finding it, but anyone in the area can direct you. Their simple dish of chunks of pork and tiny golden-fried balls of potato served with a standout pineapple and mint sauce was the 2007 tira-gosto winner. When you need a bar break, take an afternoon trip to the Pampulha neighborhood, where several Niemeyer buildings stand, including his famous Church of São Francisco de Assis. The neighborhood also houses Belo Horizonte’s most famous restaurant, Xapuri (Rua Mandacaru, 260, Pampulha, 55-31-3496-6198), the best place in town to try the traditionally rustic cuisine of Minas Gerais. And Sunday morning, you can find unusual gifts at the Hippie Fair (a k a the Feira de Arte e Artensanato da Afonso Pena), two long blocks on Avenida Alfonso Pena crammed with clothing, jewelry, household goods and crafts. When you’re done, stop at food stalls at either end for fried fish or coconut sweets, or pop into the beautifully landscaped Municipal Park park just below the fair to relax. In either place, you won’t be far from a vendor ready to crack you open a can of Skol. In Belo Horizonte, the world’s a bar. Flights from New York to Belo Horizonte usually require a stop in São Paulo. A recent Web search showed round-trip fares on TAM Brazilian Airlines starting at about $1,100 for travel in November. The Mercure Belo Horizonte Lourdes (Avenida do Contorno, 7315, 55-31-3298-4100; www.mercure.com), part of a dependable chain, is modern and theirs is always a taxi waiting out front for you. Double rooms start at 174 reais on weekends and 245 reais during the week ($95 and $133 at 1.84 reais to the U.S. dollar). Cerveja (sare-VAY-zha): beer; Garrafa (ga-HAHF-ah): bottle; Chopp (SHO-pee): draft beer; Mais uma! : I’ll have another! ; Desce mais uma rodada: One more round; Saideira (sah-ee-DARE-a): One last round. Adoro boteco! Eu sabia da fama de BH, mas agora fiquei com vontade de passar por todos esse botecos pra tomar uma geladinha e comer uns tira-gostos. Quem sabe na minha proxima ida ao Brasil neh? Beijos e nos vemos aqui em Madri! Pra quem já tá combinando encontro em Madri, Beagá vai ser moleza! Bjos! Passar em todos os botecos!? Muda pra ca entao! hahahahahahaha!